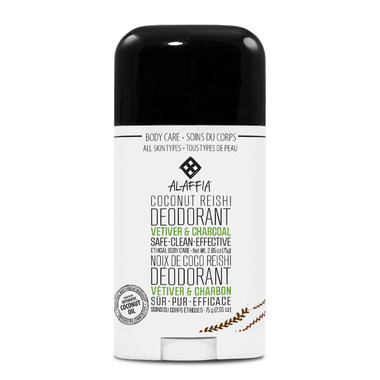 This activated deodorant, with soothing coconut, purifying neem, odor neutralizing charcoal, protective shea, and nourishing reishi, will leave you fresh all day. Ingredients: Glycerin, Water, Sodium Stearate, Saccharomyces ferment, Ganoderma lucidum (Reishi Mushroom) Extract, Emulsifying Wax, Activated Charcoal, Phenoxyethanol, Aloe barbadensis (Aloe Vera) Leaf Juice, Butyrospermum parkii (Shea)* Butter, Cocos nucifera (Coconut)* Oil, Azadirachta indica (Neem)* Oil, Natural Fragrance. Smells great, works pretty well. I think I sweat a bit more than the average bear, so I do have to reapply throughout the day. I recommend buying 2 to keep one handy! I would love to give this deodorant a full 5 star rating but it just didnt work for meðŸ˜¢. I was so hopeful as I had developed a horrible reaction to my favourite natural deodorant that has baking soda in it. This one smell amazing and has such great ingredients in it.